A complete mono or colour lighting system for rooms, aquariums, fish ponds, external lighting etc. Four  high current [350mA each] LED driver channels supporting 1-12 LED’s per string [1.75 to 17Watts (5- 48VDC supply)]. 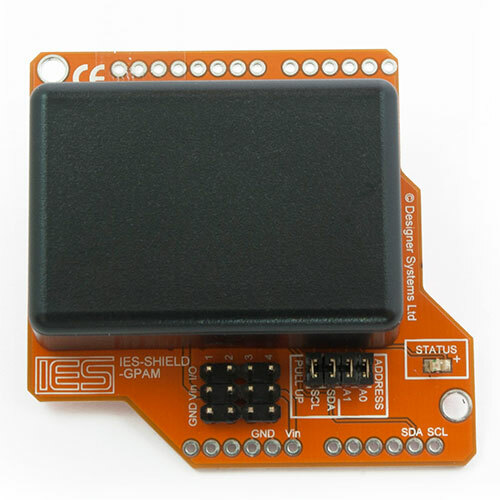 The IES-SHIELD-RGBW is a four  channel high current LED driver shield capable of driving four  1-12 LED chains. Specifically targeted at the Arduino UNO board user [all other Arduino boards supported] and the Raspberry-Pi. 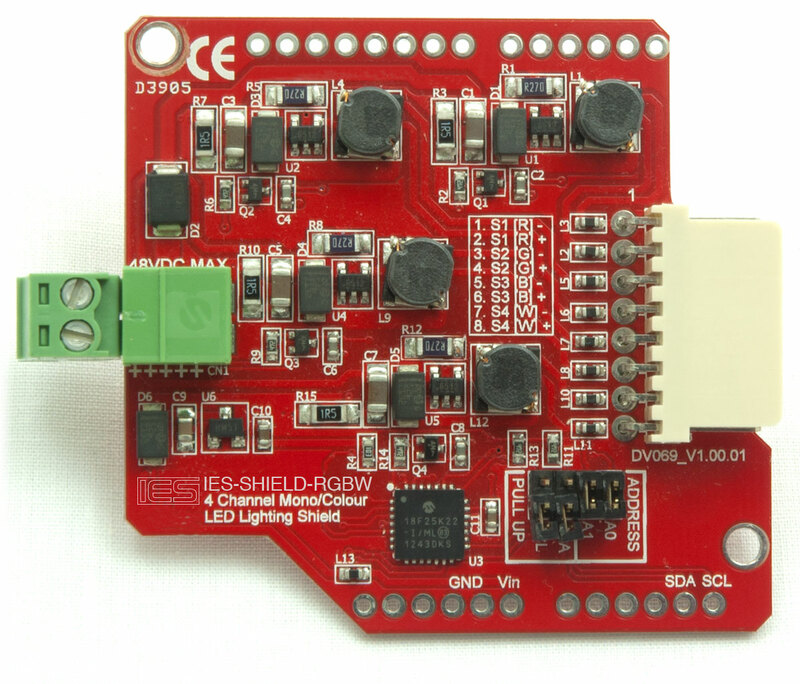 The RGBW features high speed I2 C communication for easy project integration and smooth brightness control. Each of the four  350mA capable channels features a 1024 step brightness control, open/short circuit protection, current monitoring and can support a LED chain of 1- 12 LED’s [dependant on power supply connected]. This allows the user to create RGBW lighting effects, using the supplied RGBW lamp, or driving external RGB strips /coins etc. or 4x white strips /coins for accent lighting, room lighting, aquarium lighting etc. The built in aquarium mode provides advanced control of the supplied RGBW lamp, or external 10Watt RGBW lamp, to provide simulation of moonlight, sunrise, day and sunset cycles which run on an internal 24 hour timer. 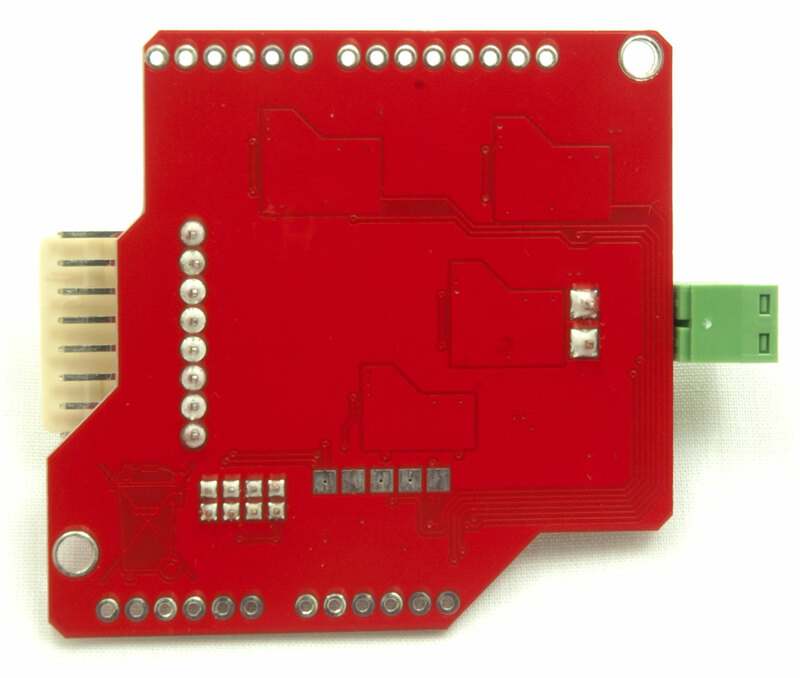 The on-board I2 C pull-ups are jumper configurable to allow disconnection when connecting to the Raspberry-Pi, which has its own pull-ups. The supplied RGBW 4W lamp features high quality OSRAM OSLON LED’s, finned heatsink and has a maximum light output level of 340 lumens.